I have taken the first step…writing a (really, really big) check. I could pray for you, but it seems those around you might be in more need. That’s probably true! These things can barely be steered and they definitely don’t stop on a dime. …You know, I think I just saw yours. I was just at Eagle yesterday, and there was a beautiful yellow racer right in the middle of the floor waiting for the last parts to go on. I think you have holes in your brain! but I am excited for you! Didn’t you check one of these out a few years ago? In a parking lot? That is sweeeeeet! I trained in, and raced in, an Eagle and a Shadow for a number of years, and I do so miss it ( had to give it up to save my aging shoulders, I’m 52)…those cool, dawny mornings doing my miles in Chickamauga National Military Park with the mist and the deer and the occasional car. Good luck with it, you’ll love it! Laurel – I wish! I think you can probably look for mine in 4-5 weeks. How cool to be seeing them ready to go out! Debe – I do have holes in my brain, no question about that. The parking lot checkout was handcycles (they have gears, racing wheelchairs don’t) and I’ve been riding that handcycle happily for 4 years. This is going to be a very cool addition to the stable. Arno – I’m turning 50 this year, so I’m just starting to ruin my shoulders now. I worry about the flicking motion (internal rotation) at the end of the stroke – doesn’t that put a lot of stress on the shoulders? 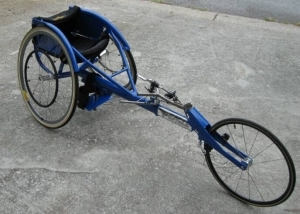 as daffy duck would say, “da-rool, da-rool!” i have been lusting after a hand bike – or maybe something like your spiffy chair – and the song “if i had a million dollars…” echoes in my head. Stephen, I think you would really like a handcycle – it’s the whole moving under your own power, wind in your hair thing.